2198. Samuel Bullen, born about 1617 in England; died 16 January 1692 in Medfield, Norfolk, Massachusetts, United States. He married 10 August 1641 in Dedham, Norfolk, Massachusetts, United States. 2199. Mary Morse, born before 13 August 1620 in Burgate, Suffolk, England; died 14 February 1692 in Medfield, Norfolk, Massachusetts, United States. * Samuel Bullen (1644-1736), married 1672 Experience Sabin (1648-1728). * Elizabeth Bullen (1647-1689), married 1668 Benjamin Wheelock (1640-1716). * John Bullen (1649-1703), married 1684 Judith Fisher (1663-1753). * Joseph Bullen (1651-1704), married 1675 Abigail Sabin (1653-1721). * Ephraim Bullen (1653-1694), married 1680 Grace LNU (1662-1689). * Meletiah Bullen (1655-1693), married 1680 Josiah Fisher (1654-1736). * Elisha Bullen (1657-1735), married 1683 Hannah Metcalf (1664-1719). * Bethia Bullen (1664-???? ), married 1686 Benjamin Colburn (1659-1714). 4398. Samuel Morse, born before 12 June 1576 in Boxted, Essex, England; died 10 June 1654 in Medfield, Norfolk, Massachusetts, United States. He was the son of 8796. Thomas Morse and 8797. Margaret King. He married 29 June 1602 in Redgrave, Suffolk, England. 4399. Elizabeth Jasper, born before 08 October 1578 in Redgrave, Suffolk, England; died 20 June 1655 in Medfield, Norfolk, Massachusetts, United States. She was the daughter of 8798. Lancelot Jasper and 8799. Rose Shepard. * Elizabeth Morse (1606-1643), married 1630 Robert Daniel (1602-1655). * John Morse (1608-1657), married 1637 Annis Chickering (1613-1693). * Daniel Morse (1611-1688), married 1639 Lydia Fisher (1620-1690). * Joseph Morse (1613-1654), married 1638 Hannah Phillips (1617-1676). * Mary Morse (1620-1692), married 1641 Samuel Bullen (1617-1692). * Robert Charles Anderson, The Great Migration, Immigrants to New England 1634-1635, Volume V, M-P (Boston, Mass. : New England Historic Genealogical Society, 2007), Samuel Morse sketch, pages 171-177. * G. Andrews Moriarty, English Origins of New England Families, Volume 2 (Baltimore, Md. : Genealogical Publishing Company, 1964), Morse family, pp 262 ff. * William S. Tilden (editor) History of the Town of Medfield, Massachusetts, 1650-1886, (Boston, Mass. : Geo. H. Ellis, 1887). I have done no original research on this family line. * LESS than 25 DAYS for the next i4GG (Institute for Genetic Genealogy) 2018 Conference! * The In-Depth Genealogist YouTube: Team Black Says Farewell on Relative Race as Long Lost Family Continue to Reunite Families. 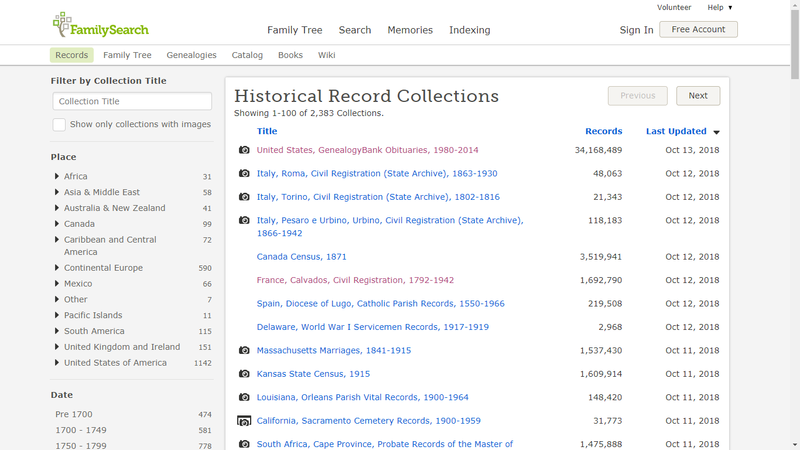 Did you miss the last Genealogy News Bytes - 13 November 2018? 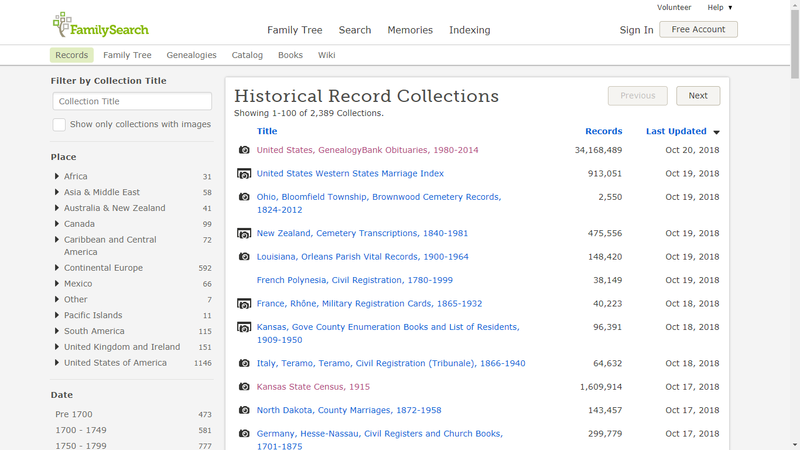 There are more than 383,000 new records and newspapers available to search this Findmypast Friday. Over 224,000 new records have been added to our collection of National Archive's First World War Soldiers' Medical Records. Including both images of transcripts, these records will enable you to discover when and where your ancestor was wounded, the nature of their wounds, where they were treated, how long they were held for treatment and details pertaining to their service history. This collection comprises The National Archives' series, MH106, War Office: First World War Representative Medical Records of Servicemen. Only a sample of the medical records was retained. These records are a representative selection of the full collection of medical records created during the war. 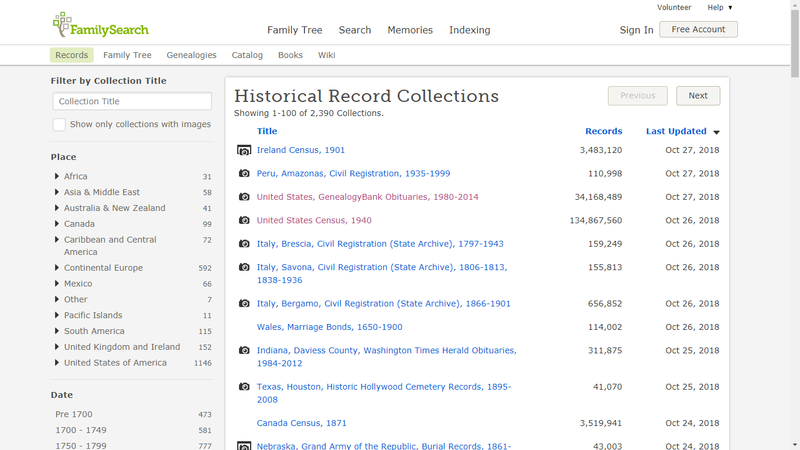 Due to data protection, Findmypast has only published records where the admission year is dated back 100 years. For this reason, more records will be released in the coming years. The records include admissions and discharge records from hospitals, field ambulances, and casualty clearing stations. You will also find records from Queen Alexandra's Military Hospital before the First World War, dating from 1910. Below is a full list of the hospitals and medical facilities represented in the records. Explore more than 2,400 pages offering fascinating glimpses into a proud regiment and its evolution from the Boer war to the end of the First World War. These books provide, in many cases, the only record of men who served with the King's Royal Corps, certainly up until 1914. This is the most complete collection of King's Royal Rifle Corps Chronicles published online and a welcome addition to our ever-growing military collection. The King's Royal Rifle Corps Chronicle was first published by the regiment in 1901 and this release by Findmypast covers the years 1901 to 1920 with gaps, at present, for 1915 and 1919. The King's Royal Rifle Corps fielded four regular battalions and a regimental depot headquartered at Winchester and the chronicles record, in often minute detail, where these battalions were stationed and what they were doing in those stations. All serving officers are named, as well as colour sergeants and often other senior NCOs and some riflemen. First published by the regiment in 1890 the Chronicle on Findmypast contains over 4,800 pages and covers a complete run from 1890 to 1920. These volumes will be of particular interest to anyone who has a general fascination for the late Victorian and Edwardian regular army and the evolution, and destruction, of a regiment during the First World War. These books provide, in many cases, the only record of men who served with the Rifle Brigade, certainly up until 1914. These volumes are often profusely illustrated with the men appearing in these photos usually named. The volume for 1893, in particular, includes a number of plates of named officers, warrant officers and NCOs from the 1st, 2nd and 4th Battalions as well as articles on such diverse topics as notes from the Crimea, the Mashonaland frontier delimitation, marching in India, and sport in Western Tibet. Sport played a big part of regimental life and inter-company and inter-regimental sports are often detailed at great length. On the 19 December 1923, Prime Minister, Stanley Baldwin, a former President of the Board of Trade unveiled a Roll of Honour which was initiated by the staff after the war. The Roll was inscribed with the details of more than 2,600 employees who lost their lives during the Great War. Each record is a transcript of the original. 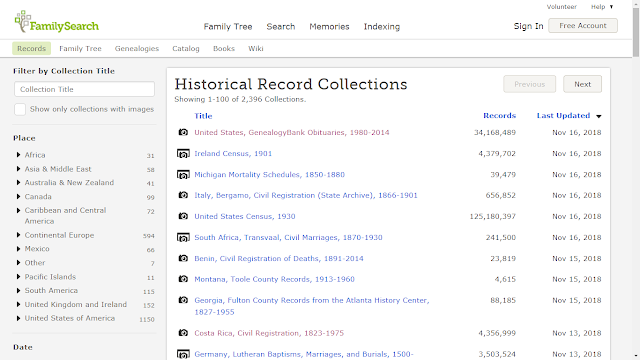 The amount of information listed varies, but the records will usually list a combination of your ancestor's birth year, birth place, death date, manner of death, place of enlistment, service number, regiment/corps, rank, decorations, civil rank, home department, family details, residence and more. 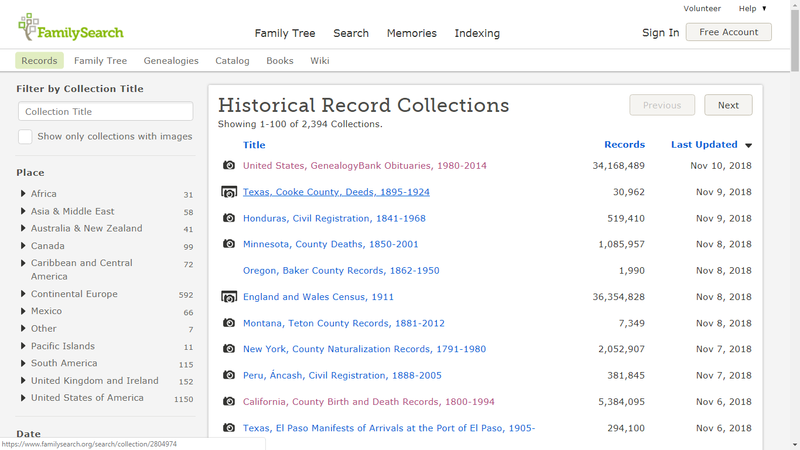 This week we have added 149,524 pages to The Archive. We have updated seven of our existing titles, with updates to Lloyd's List, late twentieth century pages from the Perthshire Advertiser, as well as further additions to the New Ross Standard and the Liverpool Echo. We also have exciting updates this week to our special cinema publication, The Bioscope. This week's updated pages cover the years 1911 to 1913, spanning the early days of commercial cinema. 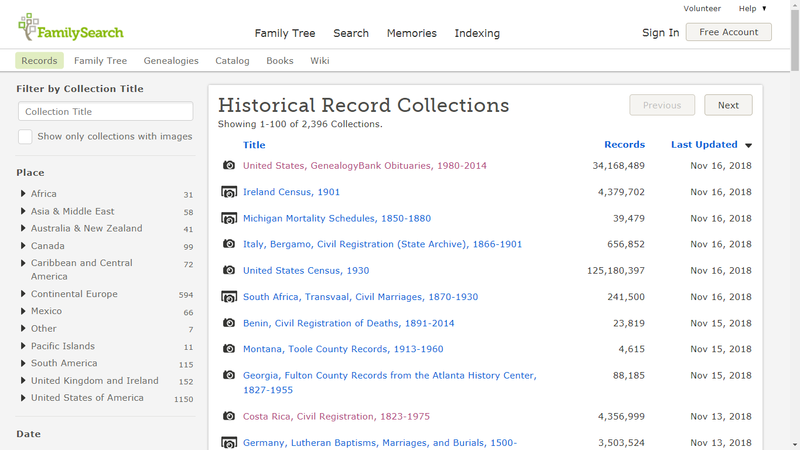 Joanna --?-- (about 1692 - about 1762) is #377 on my Ahnentafel List, my 6th great-grandmother, who married #376 William Champlin (1687-about 1778) in about 1720 in Rhode Island. * their son #188 Elijah Champlin (1730-1779), who married #189 Phoebe Card (1730-1787) in 1751. The parents names, birth date and birth place of Joanna --?-- are unknown. 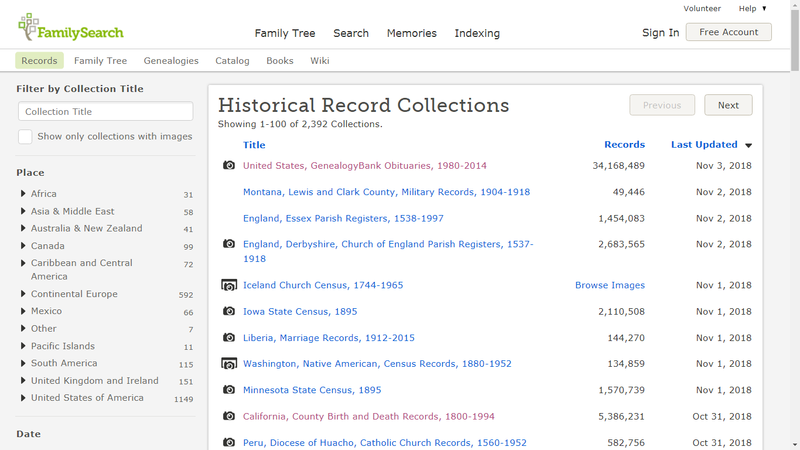 Some authored works and online family trees say that Joanna's maiden name is Joanna Watson. Apparently, there is no extant record with that name. Joanna --?-- was born in about 1692, probably in Rhode Island. The most complete Champlin family history with information about this family is by Robert Champlin of Newmarket, Ontario. He provided a computer file of many of the early Champlin families. Some of the information below was compiled on July 17, 2000 by Robert Champlin, and supplied by him for the personal use of the readers. The family resided in Charlestown, Rhode Island until about 1730, when they moved to Westerly, Rhode Island. In 1754, they were in South Kingstown, Rhode Island when William bought land there. In two 1757 deeds where William sold land in South Kingstown, Joanna released her dower rights in the deed. The family moved to Charlestown, Rhode Island, and William bought 244 acres of land there in 1760. He sold half of the land to his son Elijah Champlin in late 1760, and Joanna released her dower rights. In 1762, William sold the remaining half of the land in Charlestown, but Joanna did not sign the deed releasing her dower rights. This implies that she may have died between 1760 and 1762. There are no death records for Joanna Champlin. There are no known probate records for William or Joanna Champlin, and there are no burial records for them. 1. Robert R. Champlin, Champlin Families in America (Newmarket, Ontario : the author 274 Plymouth Trail, Newmarket, Ontario, Canada L3Y 6G7, bchamplin@rogers.com 2011, provided by email to Randy Seaver), William Champlin sketch. 2. Charlestown [R.I.] Town Clerk, "Land Evidence Books, 1738-1931," Church of Jesus Christ of Latter-Day Saints ( Family History Library, Salt Lake City, on 6 FHL US/CAN Microfilm and https://familysearch.org), Vol. 2-3, 1760-1790, Volume 2, Page 39 (image 56 of 567), William and Joanna Champlin Deed to Elijah Champlin, executed 10 December 1760, recorded 8 January 1761 (accessed on FHL US/CAN microfilm 931549).